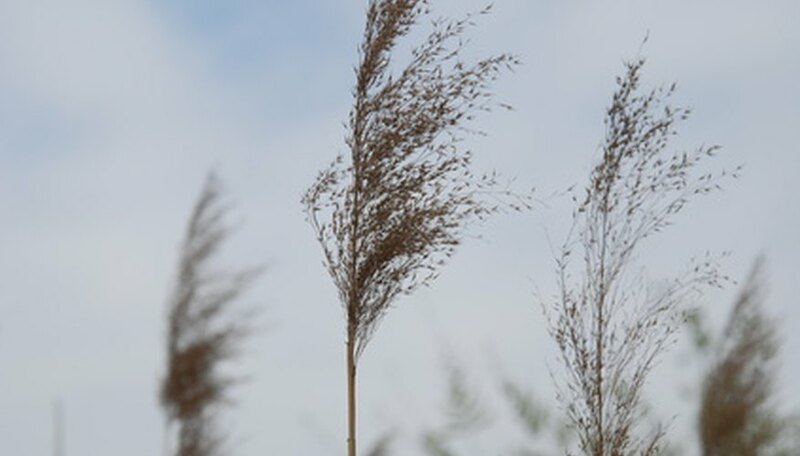 Reeds (Phragmites australis) grow 6 to 12 feet tall with long, sharp, bluish-green leaves. They work well as a forage for cattle and horses and as erosion control. They grow throughout North America and are actually considered noxious weeds in some states. Reeds grow from rhizomes and will thrive with little care after planting. Knowledge of how to plant the rhizomes will help you produce a plant that can thrive in marshy areas. Obtain rhizomes for planting the reeds right after the danger of frost passes in spring. In the South, this can be as early February. As you move farther north, this date pushes back. Find a suitable area to plant the reeds. This plant prefers wet areas on the banks of streams, lakes and in marshes and swamps. It grows best in clays and likes moderate salt content and partial shade. Dig a hole 2 inches deep for each rhizome with a trowel. Place the rhizomes with the eyes facing upward. Space multiple plants about 2 feet apart. They will quickly colonize and fill in the space. Water the reed rhizomes deeply after planting, soaking the soil. Keep them wet throughout the growing season. This plant actually prefers water levels that fluctuate between 6 inches above soil level and 6 inches below soil level.